I hope you all had a fabulous weekend. Mine was great very hot but definitely had a lot of fun. Sunday's are definitely my days to pamper myself, get things done, clean, do laundry, put on a mask, and of course change my nail polish. I have never wore blue nail polish, not that I don't like the color I just really never have thought blue would be flattering. I was flipping through a magazine at the beach this weekend and seen how gorgeous it was on this woman I had to try it. 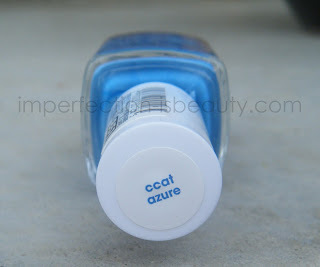 I recently purchased this Essie blue color in ccat azure. It is a dark pretty blue that really looks amazing on my skin tone. After the first coat it was very opaque. This is the second week in a row using a nail color that was opaque the first coat. I was very impressed. I did apply 2 coats and I love it. It kind of reminds me of the smirfs lol. I might add a little of my OPI Katy Perry's Last Friday Night glitter to my ring fingers, its a pretty glittery blue color that I don't really get to wear to often since its a blue glitter it might spice them up. I just got Coat Azure last week! I wore it as a base to a french tip nail with a light blue on the tips. It's a super cute color, and goes great w/your skin tone! Oh, I just noticed your bottle has a typo on the cap! It's Coat Azure! I even grabbed my bottle to check. Strange! @Jesse OMG lol thats funny well I guess I mean Coat Azure lol haha. 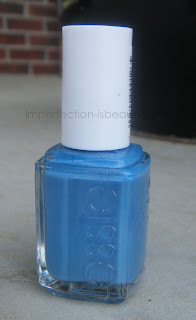 I love Essie and this COLOR, believe it or not I just bought my first essie nail color in chinchilly. Now Im hooked lol..